I am helping a fellow teacher. She accidentally installed something and her DNS now appears to be hacked. Malwarebytes found "MyCoupon" but that was all. I manually removed the offending DNS entries (82.163.143.135 & 82.163.142.137) but they keep coming back. I don't see any extensions, startup items, or other obvious signs of what is going wrong. I tried to generate a report, but there is no "Support" option under help on the version on her laptop. This appears to be new malware, and although we've located samples of this malware, there are still a lot of unanswered questions about it. Any help you can provide us would be very welcome. For anyone else reading, you can check for these malicious DNS entries by opening System Preferences and clicking the Network icon. The click the Advanced button in the bottom right corner of the Network pane. In the sheet window that drops down, click the DNS tab, and look at the entries in the DNS Servers list. If you see the malicious DNS entries in that list (82.163.143.135 & 82.163.142.137), you're infected, and I'd like to talk to you as well. Please feel free to respond here or send me a direct message. Yup, that's a good analysis, but there are still a lot of questions left unanswered, and we need to see a real-world infection to answer them. Sorry, I was out in the woods for the past two days and just got back into the electronic world. I attached the file once to you privately and will attach it here now also. In the window that opens, look for an item named "Cyclonica.plist". If you could send that file to me, either here or via direct message, that would be helpful. Ooh, yeah, that looks like that's it. Delete that file, then restart the computer and see if you can change the DNS settings at that point. Look for the folder named "Cyclonica" and zip that up. For that one, definitely please send it to me via direct message rather than posting it here, due to the sensitive nature of the contents. (Note that I'm not sure what else might be in that folder, in addition to the malicious executable, and whether it would be appropriate to post publicly or not.) I'll share the executable with other researchers. Also note that, yes, this was a lame method of transmission. A popup came up that she clicked and followed through with. That was going to be my next question, once we completed the cleanup. I don't suppose you still have whatever she downloaded and opened, do you? I am not sure exactly what it was or the details either. Also, I was able to delete the DNS settings before, but they would eventually change back to the 82.xxxx IP's at some random time after the change. That's too bad, but not unexpected. Anyway, back to cleaning up the machine, since that folder you sent over was empty and the executable gone for some reason, there should only be one last thing to do. 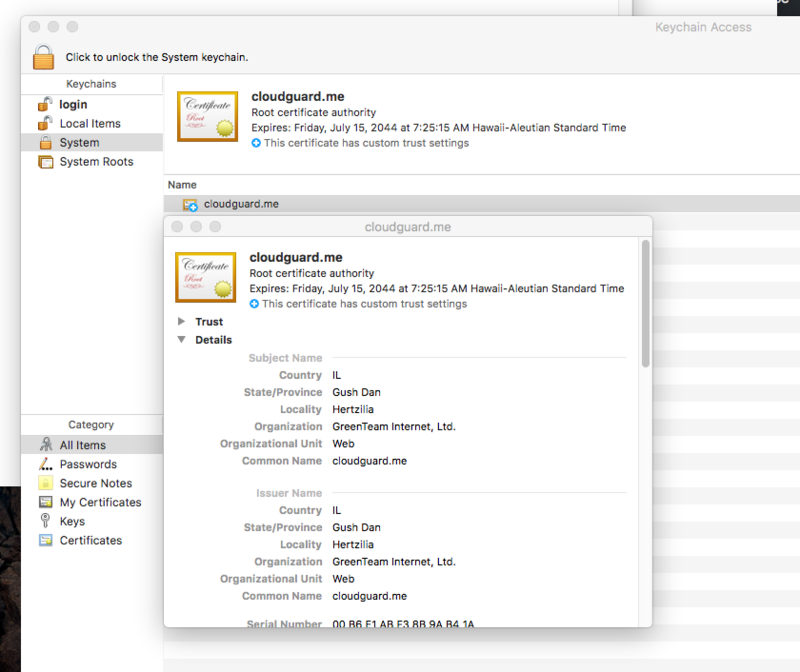 This malware also adds a certificate from cloudguard.me to the System keychain. That will need to be removed. So open Keychain Access, navigate to the System keychain there, and delete the cloudguard.me certificate. I contacted Simon at Obdev (Little Snitch) and asked about his opinion on this. He suggested adding these rules to block against the DNS servers being installed. This malware called OSX/MaMi is an unsigned Mach-O 64-bit executable - that means, macOS will warn you when you run this executable and Little Snitch will warn you in case this unsigned process wants to make any network connections. Still - the tricky part comes in when you actually run the executable, enter your admin password and therefore allow it to change your system configuration, particularly your DNS configuration. As Little Snitch comes with a factory allow rule for the /usr/sbin/mDNSResponder process which is the central service in macOS that maps computer names to Internet addresses. This rule allows mDNSResponder to connect anywhere. Therefore Little Snitch will possibly not warn you once your DNS servers have been changed, as these connections are usually intended. The article also describes that these populated DNS servers are 82.163.143.135 and 82.163.142.137. You could simply copy the lines and paste them into the Little Snitch Configuration to create the rules." Apple would have neutralized OSX / MaMi with the update of MRTConfigData to version 1.28 and XProtectPlistConfigData to version 2098. Check in system information / installations. Actually, XProtect 2098 does not yet protect against the MaMi infection because the source of the infection has not yet been determined. no news on eliminating this threat? Malwarebytes for Mac has been detecting it for a while now. If I remember correctly, it started detecting the payload around January 16 or 17, except AFAIK, the attack vector is still unknown. Yeah, we know that when you run the malware, it installs itself... but we're no closer to finding the infection vector designed to run the malware in the first place. Nobody that I know of has found it yet. Unfortunately, that's not unusual. Careful. On Mac. They are hacking rampantly whoever they are. And perhaps trolling blogs. They are in mdnsresponder and raccoon. Logging information, sites you go to etc. Perhaps more. Many people have expressed concern online but nobody seems to have an answer. They use Apple credentials to hack ports. They might even be getting into the terminal command for some. Whoever they are. They are pros. Little snitch/wireshark will scratch the surface. How can you notice if you are under this type of attack? And in the eventuality how should one behave? Is there already a remedy? I located this ip 184.105.247.203 connected. To the mDNSresponder on a MacBook Pro, associated with hundreds of complaints. One person said they hacked and changed his Facebook account password. If they can see that. Imagine all the private photos and messages they hack into. They are in mdnsresponder and raccoon. I'm not sure what you're referring to, but mDNSResponder and raccoon are both legitimate Apple processes and not malicious. Further, they have no role in this malware. Can you clarify what you have observed? private photos and messages they hack into. Sure I believe they are being used to possibly transmit data to and from a host. Or are being manipulated by other networks. Im not exactly sure what we are dealing with.